President Sergio Mattarella, an EU loyalist chosen by the political class rather than elected directly by the people, used his largely ceremonial position as head of state to controversially block the two parties’ previous Cabinet from taking office, on grounds that he did not like the proposed economy minister, Paolo Savona — a eurosceptic who has argued for Italy to have a ‘Plan B’ for exiting the euro and readopting a national currency of its own. The populists vowed to stand by their candidate, with M5S calling for Mattarella’s impeachment and Lega calling for fresh elections — leaving the elderly president free to call on Carlo Cottarelli, a former International Monetary Fund (IMF), to form a technocratic, globalist-friendly ‘caretaker’ administration. That plan unravelled amid a public backlash when Cottarelli found himself unable to drum up any support for a ‘non-political’ government, and it looked as though Italians would have to head back to the ballot box again and deliver an increased populist mandate — until news today that M5S and Lega had apparently reached a deal to submit another Cabinet to Mattarell, minus the eurosceptic Savona. 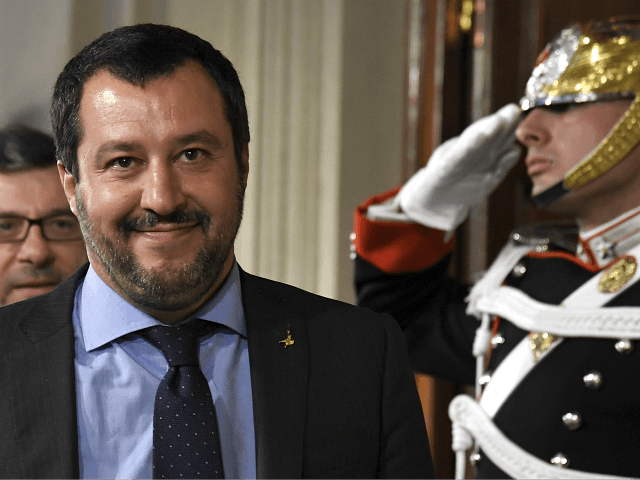 “The Five-Star Movement and the League have reached an agreement on a political government headed by Giuseppe Conte as prime minister,” party leaders Luigi Di Maio and Matteo Salvini announced in a joint statement. “Maybe finally we have made it, after so many obstacles, attacks, threats and lies,” remarked Lega’s Salvini acidly, in a message posted to Facebook not long after the announcement. Savona has been replaced by another little-known economist, Giovanni Tria of Rome’s Tor Vergata University, who had been critical of EU economic policy but stopped short of advocating a ‘Plan B’ on the bloc’s single currency. President Mattarella could still reject the proposed government, but this seems unlikely — and polls indicate that fresh elections would result in a parliament with an even more eurosceptic composition than at present.